Cerec 20th Anniversary—is it time to buy in-office CAD-CAM? • How does CEREC change what I have always done? 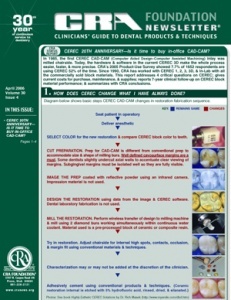 • What do I need to integrate CEREC CAD-CAM into my practice successfully? • How do CAD-CAM materials perform clinically vs. traditional counterparts? • What are future expectations for CAD-CAM Dentistry?